What better way is there to celebrate #WorldBalletDay than to go and see a live performance of the most famous love story of all time! 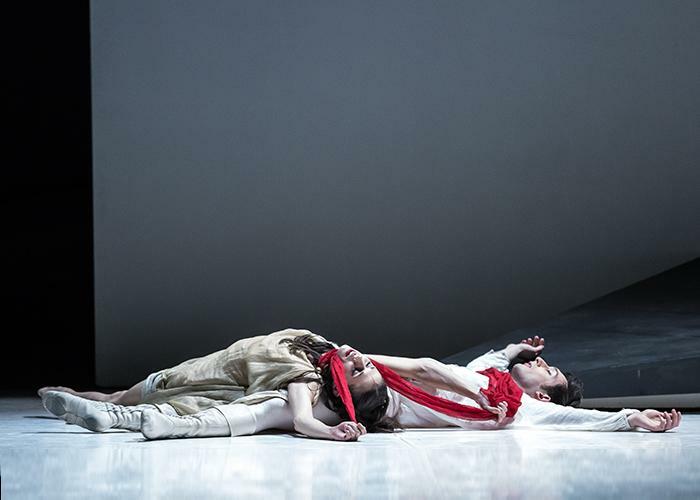 The Northern Ballet presents: Jean-Christophe Maillot’s Les Ballets de Monte Carlo’s Romeo and Juliet. Simply put, this production is amazing. It’s understated; not brash and loud, but carefully choreographed with a wonderfully youthful and playful feel. The modern choreography is enchanting. While some will beg to differ, classical ballet can sometimes be abit… long. This revival of Romeo and Juliet runs for just under 2 hours 30, including a 15 minute interval, so for those who may be concerned they’ll get restless, fear not. If anything, you’ll be left wanting more. Above all else, I would describe this reimagining as playful. There are wonderful moments of humour, particularly through the crowd-favourite Nurse, played by Pippa Moore. During her introductory scene, she danced with just her right forefinger for a few long moments, and it was beautiful – so simple, yet entrancing. Leading the cast is Dreda Blow as Juliet who is, as you would expect a leading lady in a role like this to be, wonderful. Dancing with a youthful grace, her portrayl of Juliet is exciting, and endearing. To describe her performance as perfect would not be enough. By her side as Romeo is Robias Batley who was magnificent. He danced the loved-struck soul of Romeo very well indeed, and had fantastic dominance during his scenes, showing of Juliet’s innocence in turn. One role which I did not expect to have such prominence was that of Friar Lawrence, portrayed exquisitely by Joseph Taylor. With some of the longest limbs I’ve ever seen, Taylor danced this intense character role with solemnity, gravitas and heart. It was a stand-out performance from the cast. The set for this ballet is minimalist, and very clever. With plain white moving walls, slopes and benches, the idyllic Verona is ours to imagine, and it means the dancers are the sole focus of the production – no fancy sets and elaborate lighting to distract our attention. Similarly, the costumes are relatively simple – light colours for the Montagues, and darks/metallics for the Capulets, and to my joy, not a tutu in sight. This simple contrast was all that was necessary to show plainly the difference between the two houses. This production is stunning – a must-see for dance lovers everywhere. Everything in this show is stripped right back, only to the bare essentials to aid the storytelling. It’s a fabulous piece, beautifully directed and choreographed, and makes for a great night at the theatre. A modern, youthful and playful reimagining of the most famous love story of all time.